Transportation is a vital part of one’s mobility. At New Horizons Disability Empowerment Center we can help you become more mobile. For more information or to schedule a ride, dial (928) 775-8870. 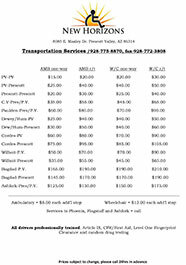 Updated on April 11, 2016 Click here for the updated ride fees.